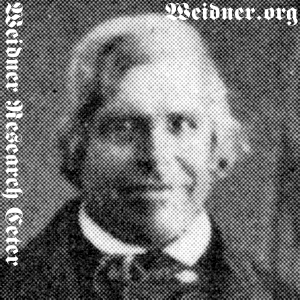 John George Weidner. Courtesy of Solemn blessing & dedication of St. Mary's School, Buffalo Grove, Illinois; By His Eminence Samuel Alphonsus Cardinal Stritch, Cardinal Archibishop of Chicago, October 5, 1947; On the Hundredth Anniversary of the First Holy Mass in Buffalo Grove, Illinois, Celebrated by the Reverend John H. Fortmann, Pastor, St. Joseph's Church, Gross Point, ILL. in the Fall of 1847. [S11] John J. Weidner, Compiled Birth, Death, 683 "of Bavaria", 629 year only. [S532] 06 Jul 1860 1860 U. S. Census, Arlington Heights, Cook County, Illinois, USA, Wheeling Township, page 154, dwelling 1077, family 1038, 1860 census states he is 49 years old and incorrectly states he was born in Illinois. [S902] Jacob Weidner, Bark Clementine Microfilm, 02 Sep 1851, The ship passenger manifest indicates he was 39 years old at the time of the voyage suggesting she was born in 1812, 104. [S11] John J. Weidner, Compiled Birth, Death, 629 date only.